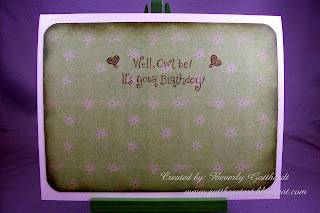 Supplies: Ivory Card Blank 5" X 6 1/2" Halcraft, Papers: Debbie Mumm, Stampin Up-Very Vanilla, all others my stash, Stamps: Inky Antics-M5-2257-J, Inky Antics-E2-1571-E, Stamp Tapestry, Inks: Ranger Archival Ink-Sepia, Ranger Adirondack-Woodlands, Prismacolor pencils, gamsol, CTMH marker-chocolate, Elmer's copper leafing pen, Coluzzle templates-rectangle, circle, metal rim tag, EK Success-sm. corner rounder punch, Martha Stewart-fern leaf punch, Prima Flowers, Stampin Up-Pretties Kit brad, ribbon-Michael's, mini heart brad, pop dots. really cute card! love the owls! HI BEVERLY! Thanks so much for playing my challenge! 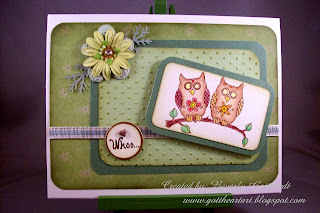 Those chinwagging owls are a hoot! Giggle....LOVE the color scheme, too. Come back and play again, SOOOON!